Learn about the Community Tree Recovery program. In 2017, the United States experienced unprecedented devastation from three major hurricanes that struck weeks apart from each other. The following year, we endured this devastation once again when Hurricanes Florence and Michael started their paths of destruction in North Carolina and Florida, respectively. With the influx of natural disasters happening around the world, it’s easy for affected communities to become forgotten each time the next disaster pummels in, overtaking the news and our attention. But the Arbor Day Foundation’s Community Tree Recovery program aims to combat this habit of forgetting, activating long-term tree recovery efforts in these affected communities once the dust settles. Florida celebrated its state Arbor Day on January 18, just a few months after Hurricane Michael made landfall in the Florida panhandle. In celebration of Arbor Day and in an effort to restore lost tree canopy from the devastation of Hurricane Michael, we held three tree distribution events in two days, giving away trees to panhandle residents who lost their trees — and so much more. 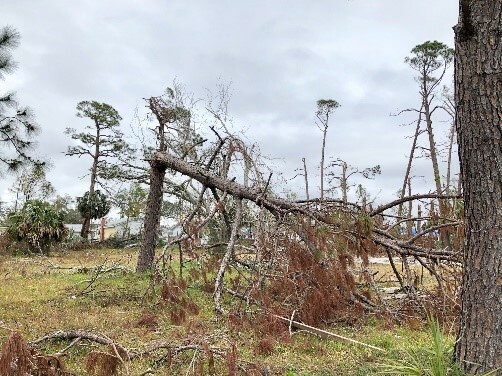 Our journey to tree recovery in Florida communities affected by Hurricane Michael started with a call from the Director and State Forester of the Florida Forest Service, Jim Karels. In our communication with Mr. Karels, he shared the damage assessment his team conducted, noting that Florida suffered $1.3 billion in timber loss, affecting 2.8 million acres and more than 200 communities. 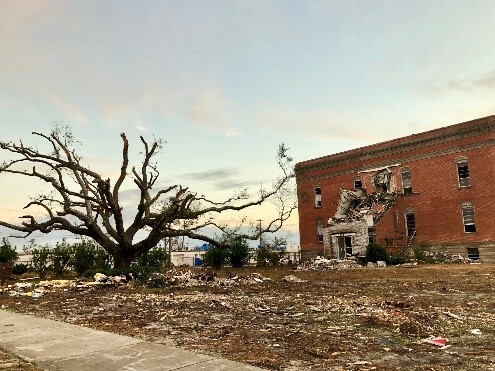 The Arbor Day Foundation has worked with the Florida Forest Service for years, but our partnership for tree recovery in the wake of Hurricane Michael began immediately after that call. In order to provide these recovery efforts, we work closely with our corporate partners and their employees to distribute free trees to homeowners affected by natural disasters. We are proud to have four companies support the Florida Tree Recovery Campaign, with FedEx, International Paper, Verizon, and Texas Roadhouse all helping to kick-off these efforts. After weeks of planning, coordination, and communication, we had three tree distribution and planting events taking place in a span of two days in three different Florida communities: Marianna, Panama City, and Panama City Beach. In total, 2,000 trees were distributed to residents and 15 large trees were planted at our host sites. Upon arrival to Panama City, the level of devastation to the buildings and landscape was absolutely sobering. These communities are still very much recovering and rebuilding after the hurricane. Given the level of destruction we were witnessing first-hand, we weren’t sure if these communities were ready to replant their lost trees. But after announcing our partnerships to start tree recovery efforts in the Florida panhandle, these communities absolutely got behind it. Residents in the Florida panhandle came out in droves. Hours before each event, homeowners began to line up awaiting the trees they got to take home and plant in their front and back yards to replace all those that were lost in the storm. In Marianna, 700 trees were distributed to residents in 20 minutes. In Panama City, 800 trees were given away in about an hour. On Saturday, 500 trees were distributed in 30 minutes. There is such a need and desire in these communities for trees in the wake of disaster. But it’s not just in these communities – it’s in every community affected by natural disasters, even those we may not see in the news. The road to recovery in the Florida panhandle may be long, but the journey has begun, and we couldn’t be prouder to work with all our partners on these efforts. Without these partnerships, these recovery efforts couldn’t be possible. Visit arborday.org/partnerships to learn how your organization can support communities affected by natural disaster.